ab12108 detects two bands >100kDa in WB. The higher MW band is probably a phospho protein as the signal is decreased when the blot is incubated with phosphatase prior to ab12108 (data not shown). However, this upper band is not GluR1 protein, as it is only detected by ab12108 and not by other GluR1 antibodies; it is therefore an unknown protein which is bound to specifically by ab12108. Synthetic peptide conjugated to KLH derived from within residues 850 to the C-terminus of Mouse Glutamate Receptor 1 (AMPA subtype), phosphorylated at T840. This antibody gave a positive signal in Mouse Brain tissue lysate. Our Abpromise guarantee covers the use of ab12108 in the following tested applications. WB Use a concentration of 0.3 - 1 µg/ml. Predicted molecular weight: 102 kDa. ab12108 detects 2 bands over 100kDa by Western Blot. Both of these bands are blocked by the immunizing phospho peptide (lane 4), but not by the non-modified peptide (lane 5). However the immunoprecipitation data (below) demonstrates that the upper band (at ~120kDa) is unlikely to be GluR1 and therefore is an unknown protein. Lane 1 (input) has two bands >100kDa as seen in the WB for ab12108, this lane is loaded with brain extract that has not been through the IP protocol. The higher MW band in the Lane 1 (input) is probably a phospho protein as the signal is decreased when the blot is incubated with phosphatase prior to ab12108 (data not shown). 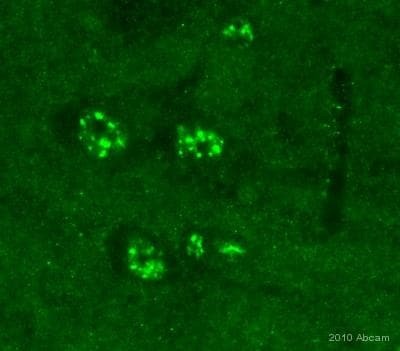 However, this upper band is not GluR1 protein, as it is only detected by ab12108 and not by other GluR1 antibodies; it is therefore an unknown protein which is bound to specifically by ab12108. Lane 3 is a control IP with mouse IgG - this is the result of using a 'pre-immune' mouse IgG antibody to see if anything is pulled down from the brain extract independent of the GluR1 antibody. The ~55kDa bands in this lane correspond to IgGs. Publishing research using ab12108? Please let us know so that we can cite the reference in this datasheet.